I've been somewhat quiet this last week - I'm all in a head spin for 2017! First up, I'm all excited about my new BOMs being released in the new year. My only problem is, I have 5 designs to choose from and I'm really struggling to narrow it down and commit. 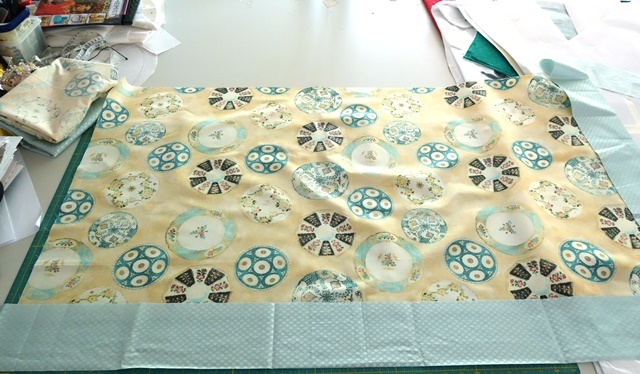 If you read my blog, you'll know that I have commitment issues when it comes to quilt related projects and fabrics. I'm really trying to decide which pattern is the right one for 2017 but each time I decide...I end up changing my mind! It sounds like a good problem to have, but it simply ends up frustrating my attempts to be organised. And then there's the issue of fabrics. Oh boy, don't talk to me about fabrics. Why is it so hard to choose? I find a gorgeous palette but then I think the tones are wrong or it's missing a vital colour...like red...so then I have to match it to another range that does have reds but now the greens are all out of balance. I'm exhausted just typing it. Take for example, my background for Sweet 2016, which on last count had 7 very possible and completely gorgeous background options. I loved each version and that's the problem. Today, I've actually cut into this fabric, which last time I reported on it was just being draped for style. Now, I think, that's it- it's cut and it's my official background. I've committed myself and can move onto the next project. Hopefully. Talk about exciting news! I think Jenny Henry might be the only quilter in New Zealand making Love Entwined and she just let me know last week that her LE had won Viewer's Choice for Amateur Quilt at the Auckland Quilt Show! WOW Jenny, what an achievement! Look at these beautiful tones, they're just incredible and it all looks so lovely, shining with it's own beauty and grace. If you can't stop at just one picture of this stunning quilt, visit Jenny's page over on the Love Entwined Gallery (click here to go there now). It really makes my day when quilter's let me know how they're getting on and when they share such happy news as this, well it's too good not to share! Well done Jenny! 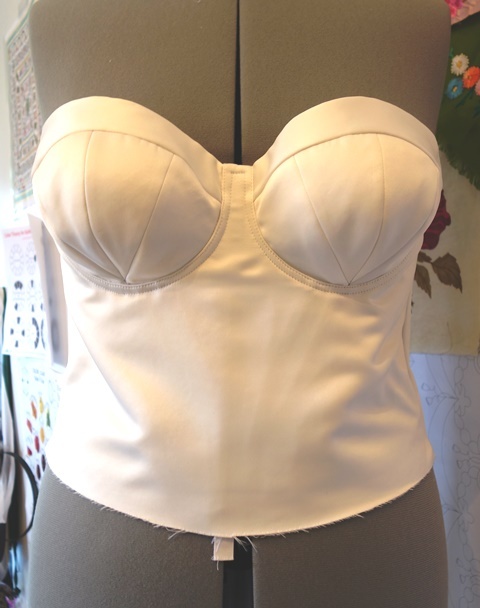 In my last post I mentioned how I created a bra based bodice with corsetry elements, specifically spiral metal boning sewn into channels just like a corset but unlike a corset in that it consists of an inbuilt supportive bra and is closed with a zip. It's decidedly not a corset even though I erroneously referred to it in my own mind as one (and the corsetry class I took on Craftsy was invaluable in mastering it). It's also not a bodice as it's so much more than a simple upper body shaped garment, so I'm calling this hybrid a bra based bodice. 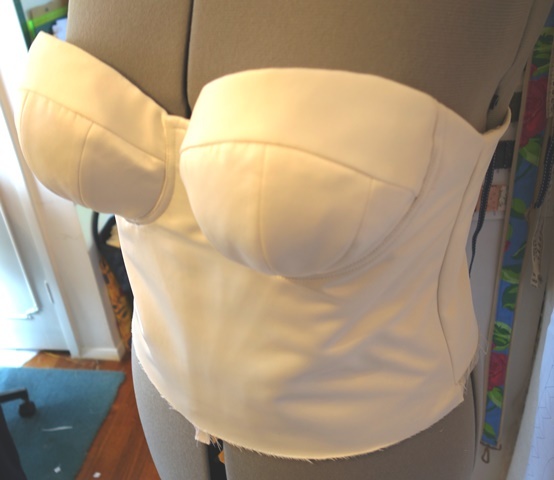 As you can see, they are very similar, this is because I relied on the Marfy visual to create my own bra based bodice. 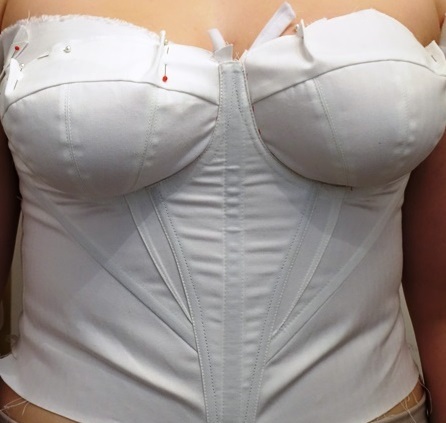 The major difference is that my bra has been created for large busts DD+ as both a functional support bra and formal gown outerwear. 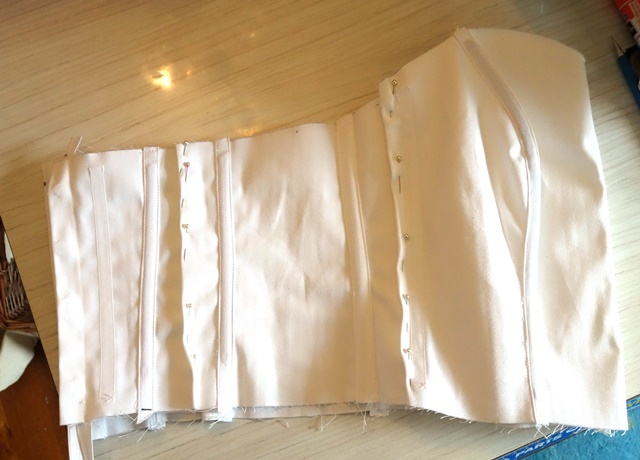 My bra based bodice also has extensive boning all around the waist to lend the required support and structure. Like the Marfy, it is lined internally and externally. 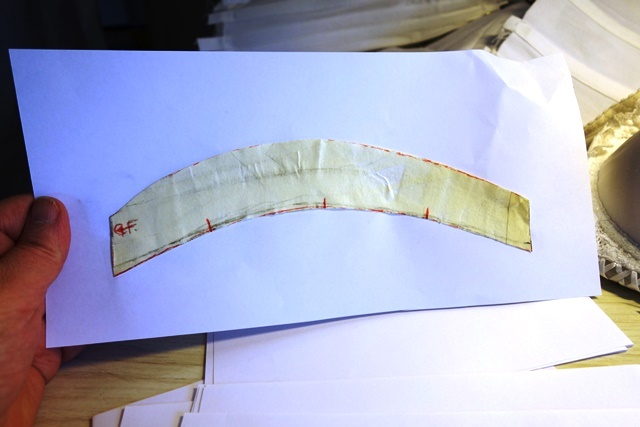 I have also added a wide strip over the cups to enforce the stylistic idea that it is a formal wear garment. You can't see it here as my image on the right is already lined but I have also used the save V boning channel as the Marfy appears to have. My V channel is actually a double channel on each side before the side channels start and wrap all the way around. Again, this has been created for support. Who knew such a visually simple garment could cause so much hassle? 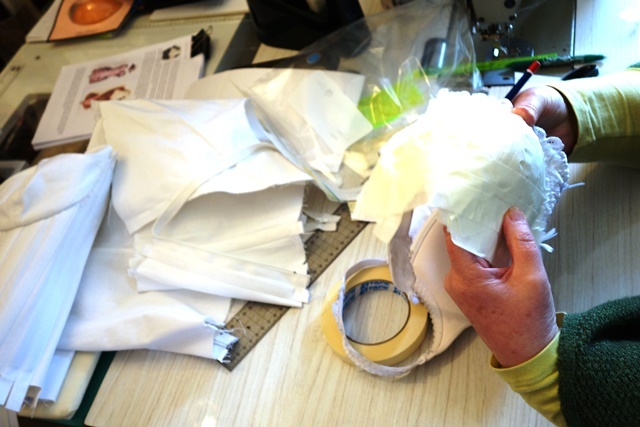 When it comes to creating the bodice, you can follow any pattern, it's really very basic sewing. 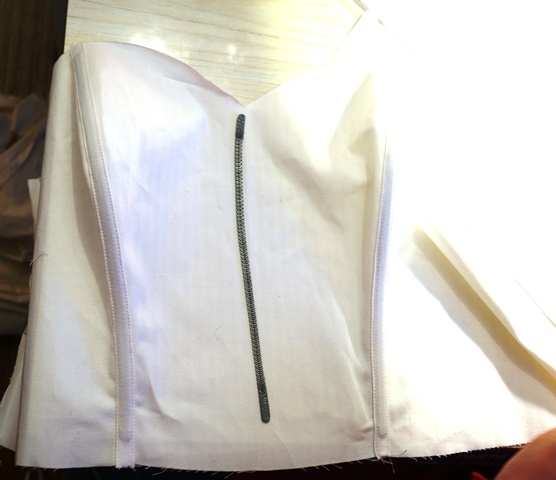 When it comes to creating and using channels to insert spiral boning into for support, I recommend that you take a class on corset making to learn these fundamental sewing techniques. 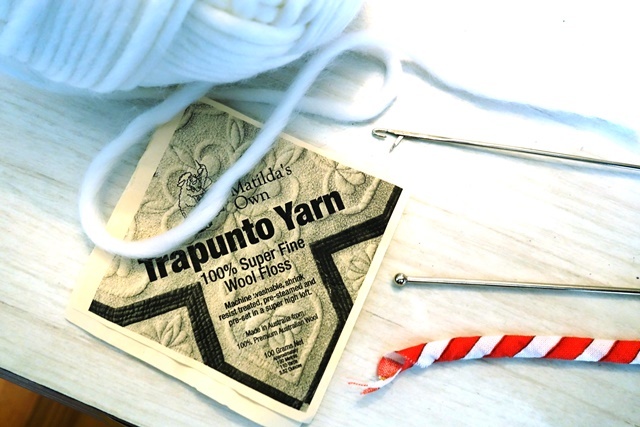 The Craftsy one I used is listed beneath this post. I highly recommend it as I found Allison Smith to be a great tutor and personally very helpful. Of course, corsets are not bras and do not have this bra style look about them. 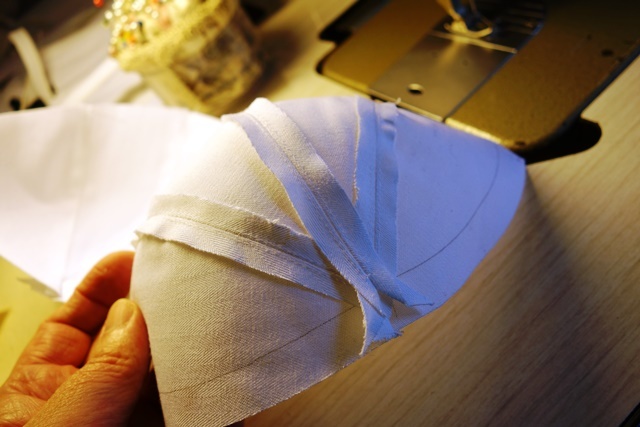 For that, you have to create your own custom cups to sew into a bodice base. What is unusual about this bra is that it has no stretch. 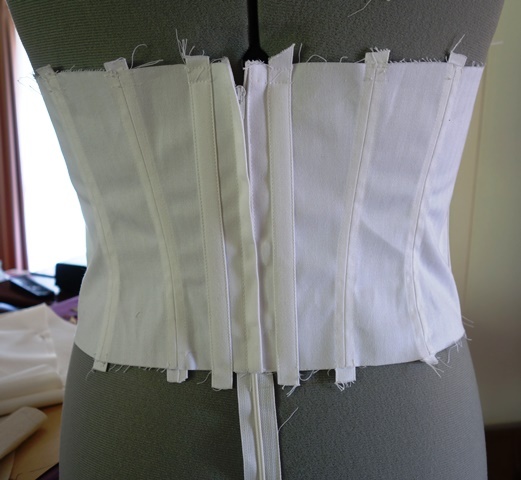 It is fashioned out of coutil which is very stiff corset fabric. It is then lined for comfort. 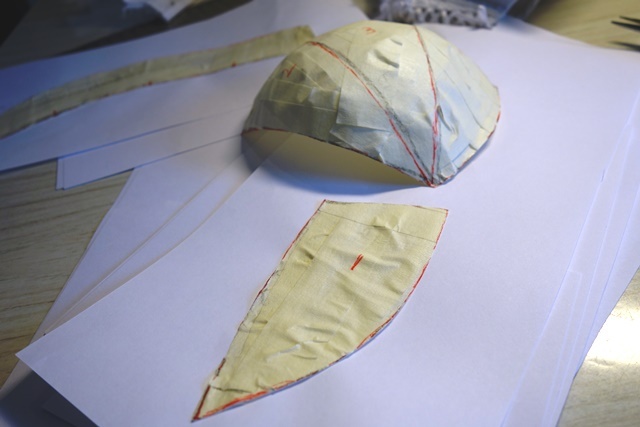 So the template you create has no 'give', you are creating a bra that is immediately outerwear and the fitting is like stepping into a coutured fabric shell. Like this. You can see in the background that it took several goes for me to understand which process would work. 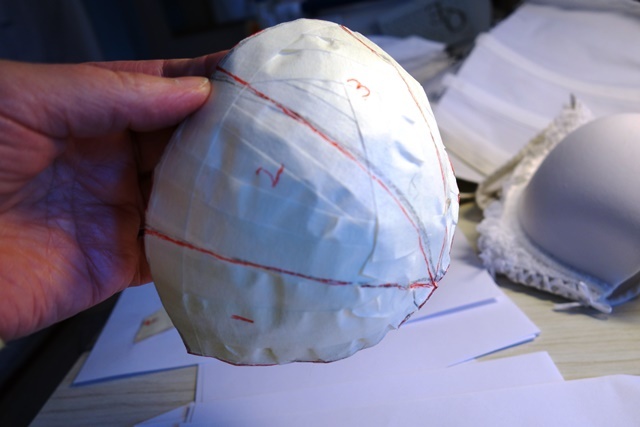 I started out pinning the bra extensively to map out a pattern. Don't waste your time. 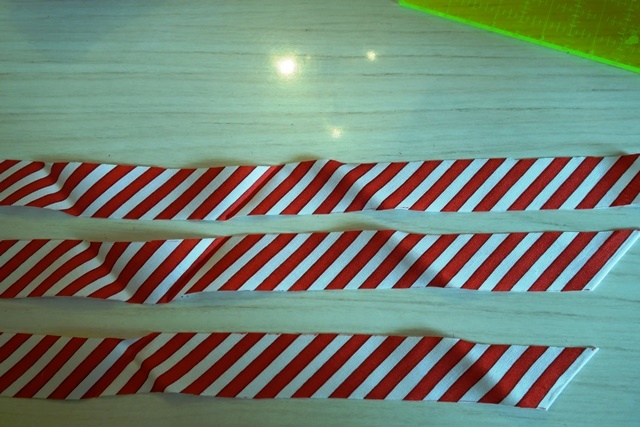 Go straight with this masking tape method. a sight for sore eyes- my beautiful, 3D cup. I was so happy when I held it in my hand! 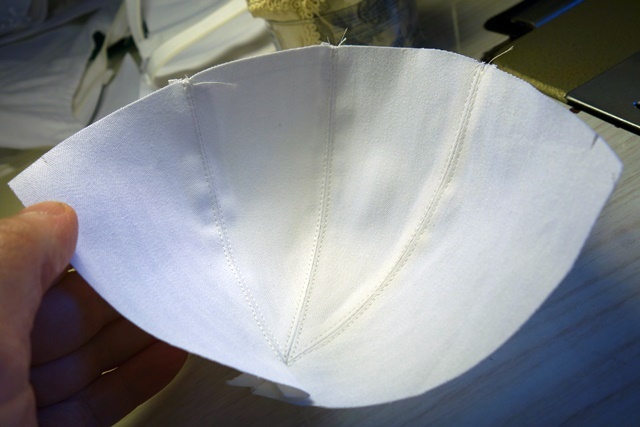 Now it's time to sew the cups into your bodice base and alter as required. As you can see, I had a few minor alterations to deal with at this stage. What you are looking at is only coutil. After this stage, line inside and out. 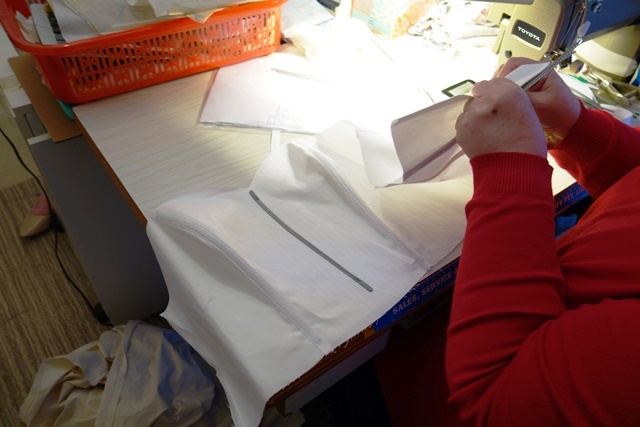 a perfect fit ready to be sewn into the skirt. And the best bit? This coutil bra is so structured that no other bra is required, for this bodice IS the bra. 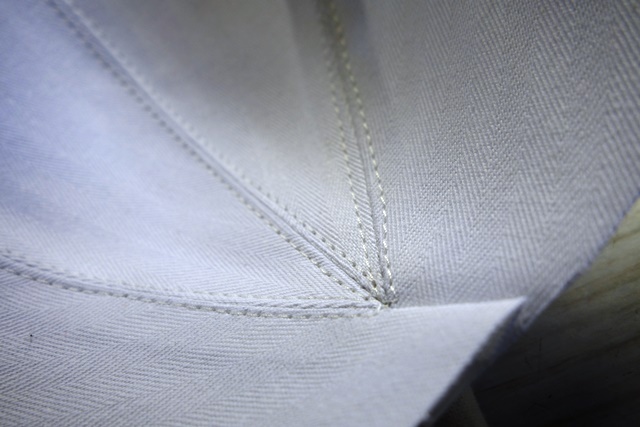 The fit is also so fitted that no stay is required to be sewn in. This is important as I see so many brides 'wiggle' into their dresses throughout the day and I think it's so unfair that they have to do this. It's something which should never happen and could so easily be prevented if bridal shops simply bothered to sew in basic stays! 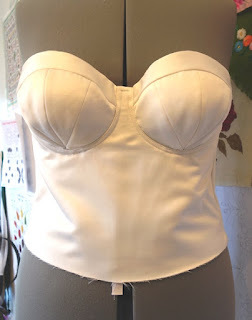 Of course, if you sew a bra based bodice like this one, you won't need one. My DD was busy all day, got in and out of a helicopter and wore her dress to dinner and never had to wiggle once - all thanks to this bra based bodice. I'm ahead of myself showing these photos because, by the time I'd finished the bodice, I hadn't even stitched the skirts, but I did want to show you here how important the bra based bodice was to the dress - and this photo shows it. The bra based bodice was the icing on the cake after all my bodice and bra making dramas. 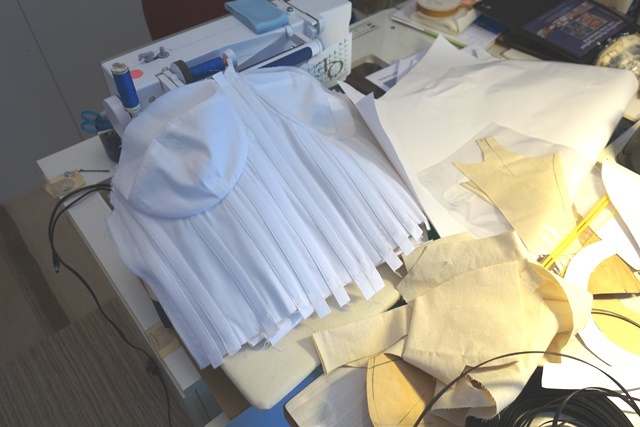 Before it came along I was trying to make ordinary bodices do extraordinary things - which they simply couldn't. 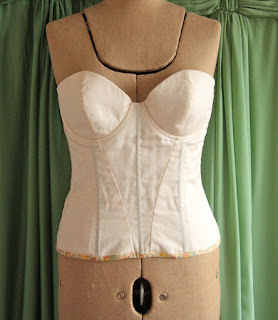 How I wish I'd started a bra based bodice first! It took me so long to conquer bodices and get to this final version, that I was sewing the wedding dress 24 hours before the wedding. 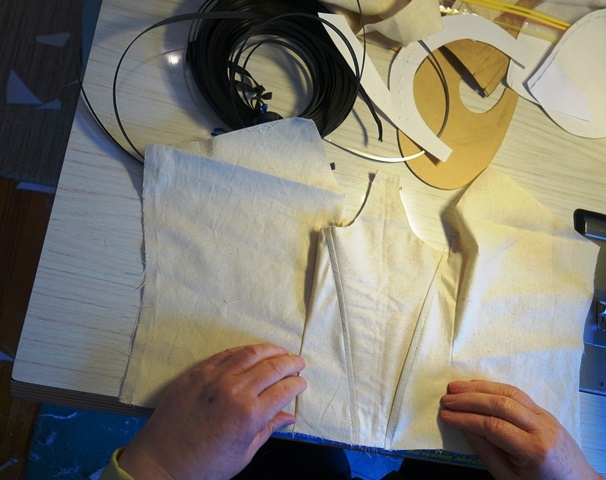 In my next post I'll blog about what I did next, against the clock, to finish this dress on time. In September 2016 I made my DD's wedding dress using the Butterick Pattern B5731 as a starting point. 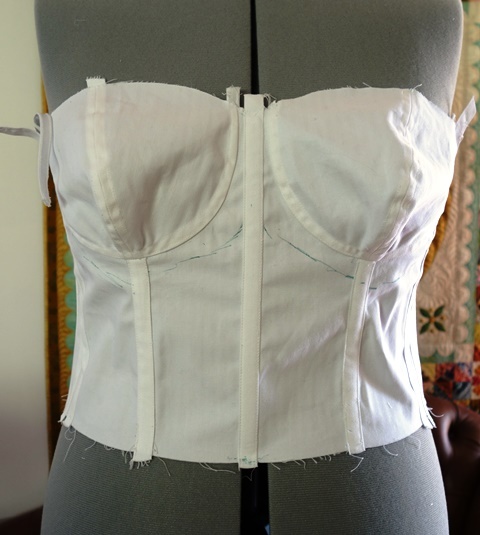 I then created my own variation of a semi corset with a built in bra as a replacement to the pattern bodice. 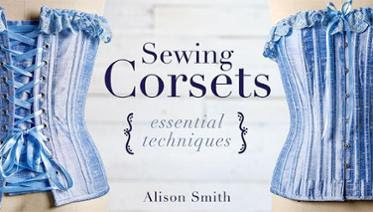 I took the Craftsy online class 'Sewing Corsets' with Alison Smith which I can recommend as essential viewing for anyone interested in sewing corsets or formal wear bodices with corset elements. In fact I even received personal advice from Alison and am happy to recommend this class to anyone who's interested. WOW: Ineke Wijer's Love Entwined! Send in the Clowns! 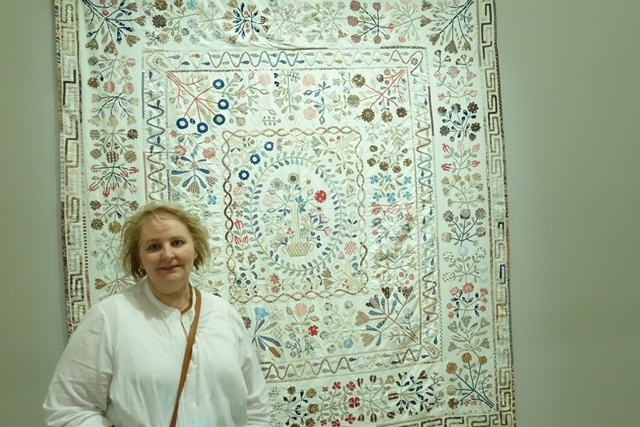 Here is Ineke Wijer's LE quilt, isn't is simply gorgeous?! Today I wanted to share this beauty because it reminds me how much has been achieved by quilter's making LE all over the world. I was in awe of Ineke's vision straight away when I saw her dark background and fun, whimsical mood which she inserted throughout the pattern with bold and fabulous fabric choices. I remember the first time I saw it over in the Group when she shared images and I was simply bowled over. 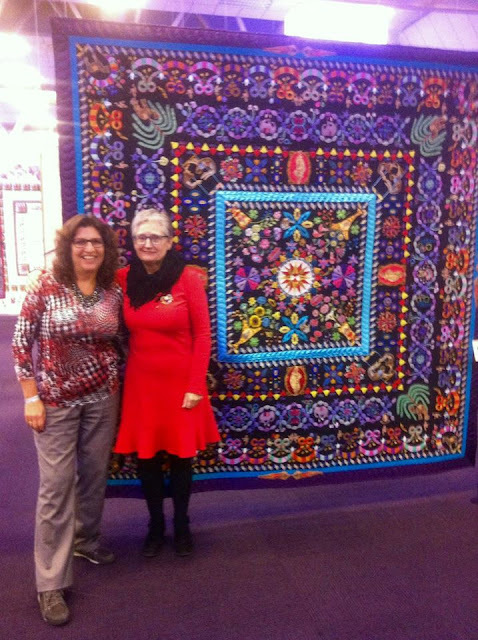 And now, in Maastricht the Netherlands (Open European Quilt Championship) Ineke received a ribbon for her version of Love Entwined named "Send in the Clowns." So well deserved! 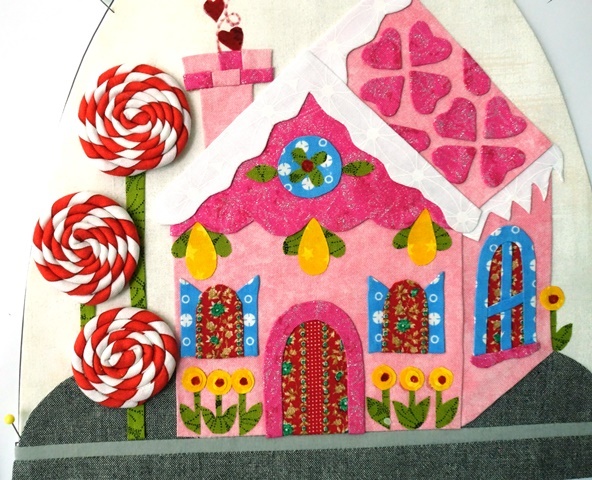 Click here to see more images of Ineke's quilt over in the LE Gallery. 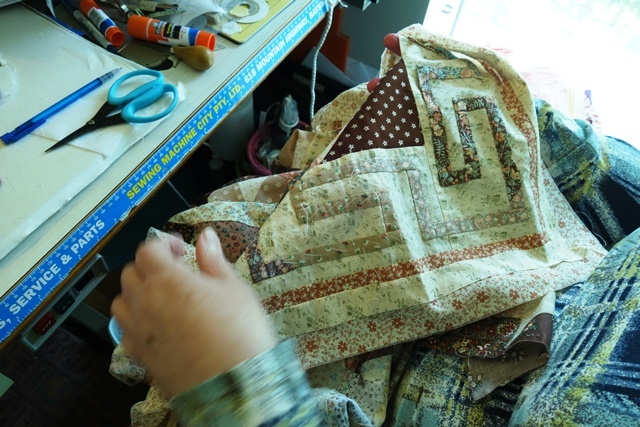 It means so much to me when quilter's take the time to share their journey and I'm so grateful that Ineke shared her good news for us to all enjoy. It's a huge motivation and always makes my day to see what everyone is up to. Don't forget that we have a dedicated LE Group over on Facebook that you can join too. One of these days it will be my own self with my own finished Love Entwined to show and share. And I can't wait until that day arrives. Talk about a work in progress! It's beginning to feel a lot like Christmas and this month, it's time to decide between two quintessential Christmas favorites - a gingerbread house or a plum pudding. You can only make one for the wall hanging and I'm curious to know which will be more popular? For me, it's gingerbread houses all the way - Christmas simply isn't complete without at least one adorning the table. Although now my children are all grown up, the houses have become much more sophisticated affairs than in years past. But fun? There's always room for an extra helping of that! And this month, I've loved deciding my house fabric and embellishments. 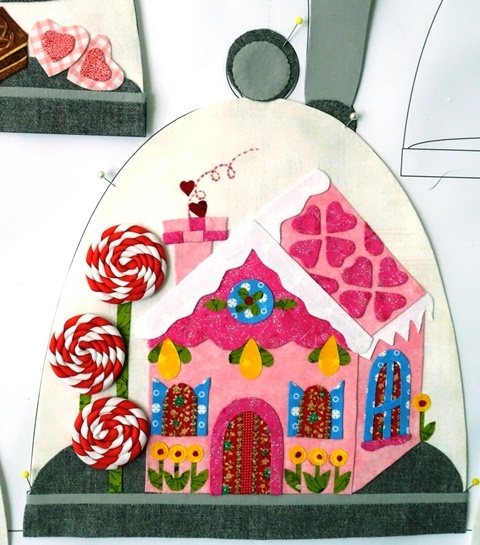 I've opted for an iced pink house - because I have some pink fabric I just knew would fit the bill. My DD once made a pink gingerbread house and it was gorgeous, perfectly iced in a crisp pale pink. Of course classic cinnamon and chocolate houses look wonderful too, so whether you want to opt for a snowed down house with lots of white beads and ribbons, or stick with classic warm hues, your house awaits you! 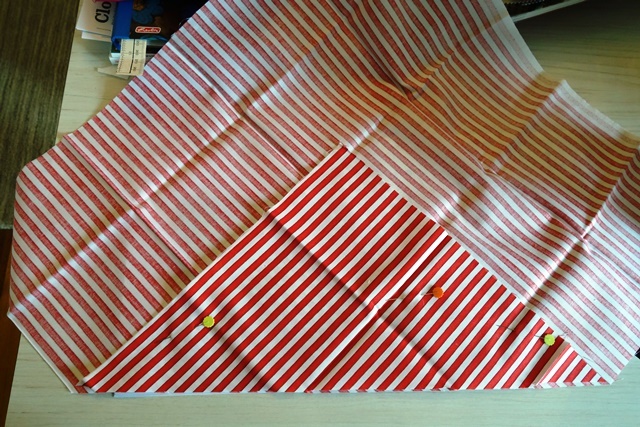 Here's the stripe fabric. This is a fat quarter. The bottom length of this triangle is 16.5 inches and I've done this so that I can cut 3 x strips, 1 inch wide, on the bias. The I pulled the fabric through to the right side. 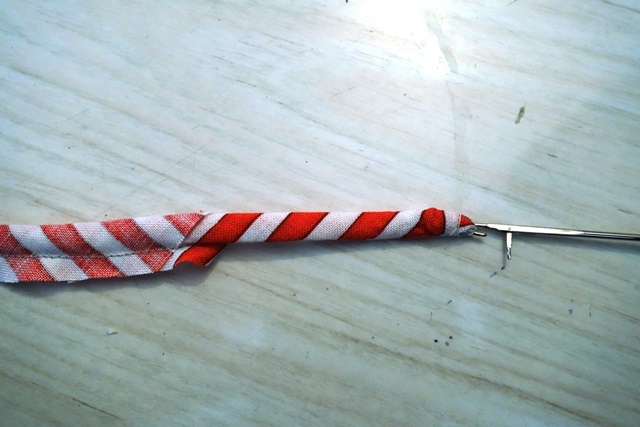 I used a rouleau loop for this, which is a sewing tool. 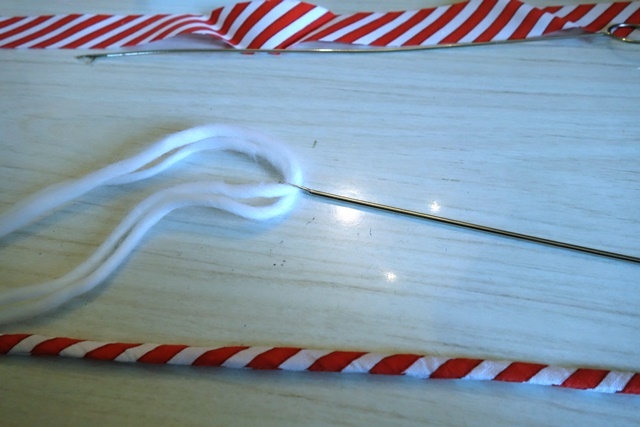 You could also use a very long needle. Then, once my bias strip was turned out the right way, I threaded a length of trapunto yarn through the middle, using a bodkin to help me do so. Again, you could also use a long needle. 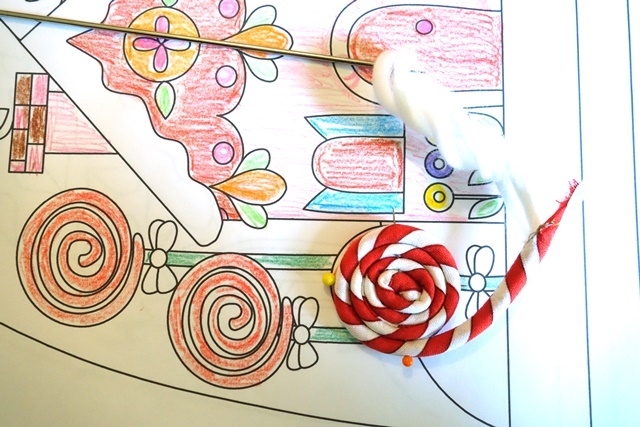 Once 'stuffed' with the yarn (and you could also use a thick knitting yarn if you don't have trapunto), I then turned the striped tube of fabric into a swirl, creating a lolly pop. As below. Just 2 more blocks to go! 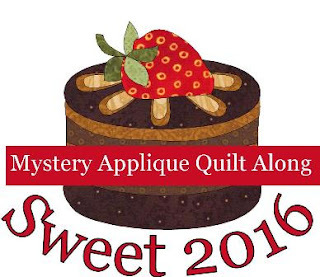 And don't forget to join my Sweet 2016 BOM Group over on Facebook too! Understanding the pattern release schedule: anyone can join Sweet 2016 at any time and when they do, they will receive a new block each month from that point onward. The day they receive each new block will depend on the date they signed up and made their first payment. Everyone who starts Sweet 2016, starts at the beginning, Part 1. Specific blocks cannot be purchased out of turn. Whenever you choose to start this BOM, be sure to keep us updated on your progress by sharing your work over in our Sweet 2016 BOM Facebook Group, see you there! 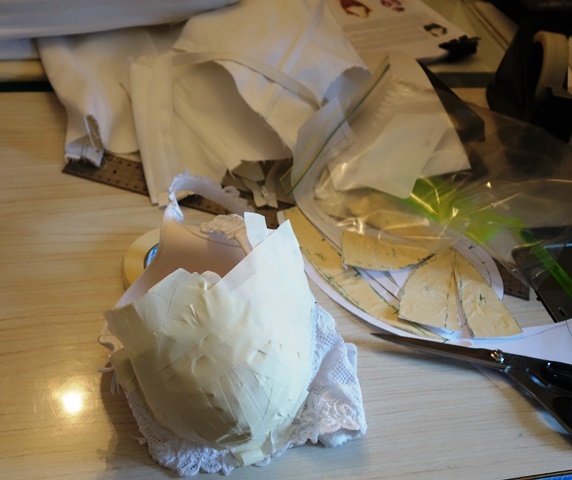 another failed bodice in the making.. Anyhow, Melanie talked about this bodice on her blog and I was convinced it was just what I needed. The only problem was, I'd never heard of Marfy and there was no way of getting the pattern in time. It happened that Melanie had the pattern in storage and could possibly dig it out which was incredibly generous of her - but I was already out of time. I had to simply draft it by scratch. So, based on this image, I made a start. 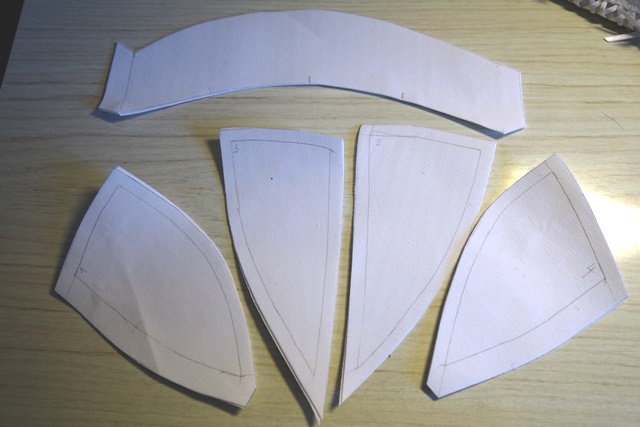 I already had the spiral metal boning and coutil I had ordered in round one of my bodice attempts, so material wise, I was confident. I'd never drafted a bodice with built in bra and corsetry elements before, but was also confident I could. Since the wedding, people who know about the drama I had have asked me how I could be so confident to take on making, what I now know is such a difficult item? Well, my answer is simple - I didn't know it would be such an epic garment when I started out. Luckily for me, I was trained the old fashioned and severe way when I trained in fashion over 40 years ago. It was very difficult to learn, but that system left me with abilities and an attitude which I haven't forgotten. 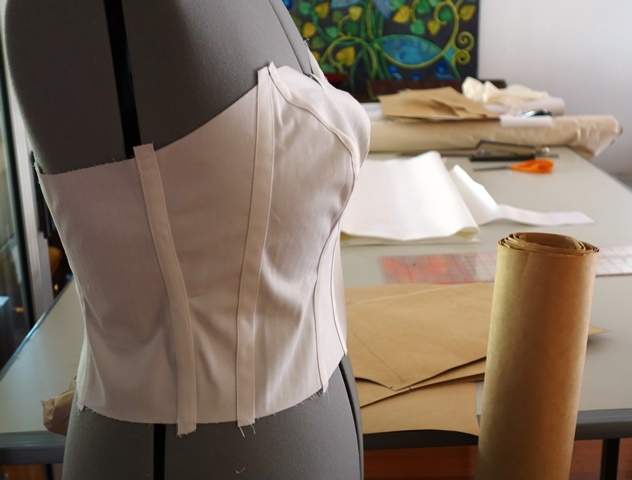 That said, I did not know at this drafting stage that creating a bodice with a built in bra and boning is the hardest garment to sew in all of garment making. I'm actually glad I wasn't aware of that fact. Or that people specialize in this area exclusively, based on it's difficulty. I would find this out later, on a professional costuming forum. It would bring me a lot of relief to find this out. Because, honestly, I couldn't work out why I was struggling so much. It was really difficult. 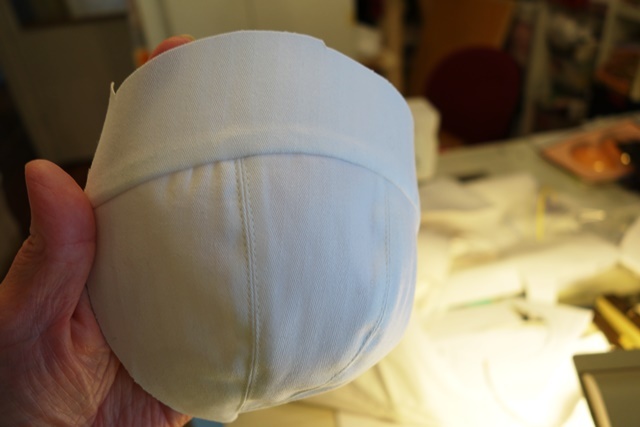 And as someone who can create a pattern from scratch with ease, the feeling of failure and endless repetition (I made 11 failed bodices in total) really got me down. I simply couldn't understand how the failures kept on happening! 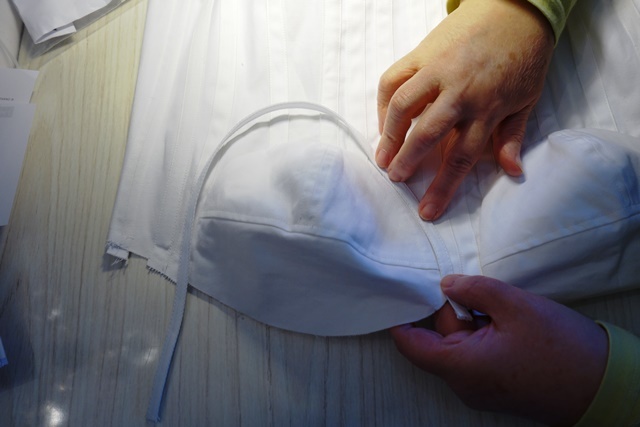 These images you see of me sewing bodices in the images are all failures. The worst thing of all is how much precious time they took me. Days! But finally, I had found found the light at the end of the seamstresses tunnel. 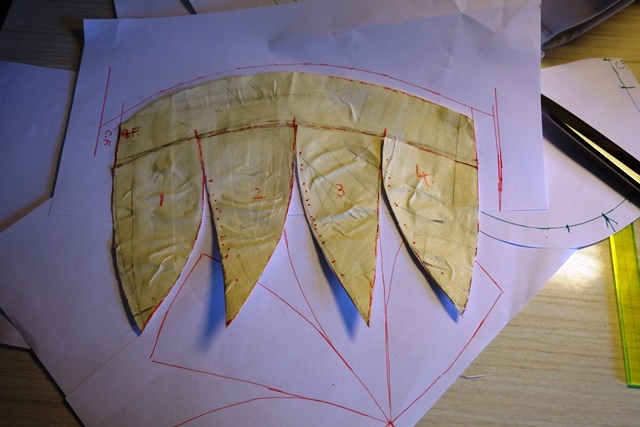 With the Marfy visual, I set about drafting the pattern. 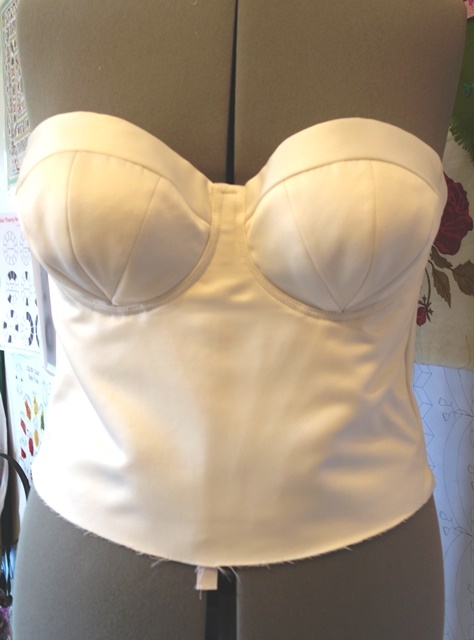 First, I thought I would simply sew in an existing well fitted bra into a bodice base. 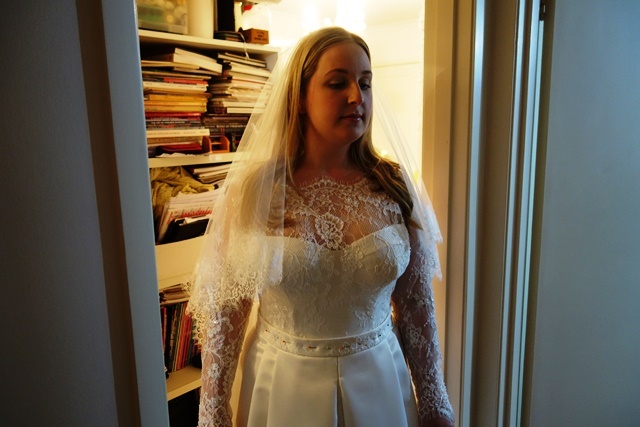 This sounds lazy, but you need to remember that I now had just days to finish a wedding dress and I hadn't even started on the final skirts yet. It didn't work. 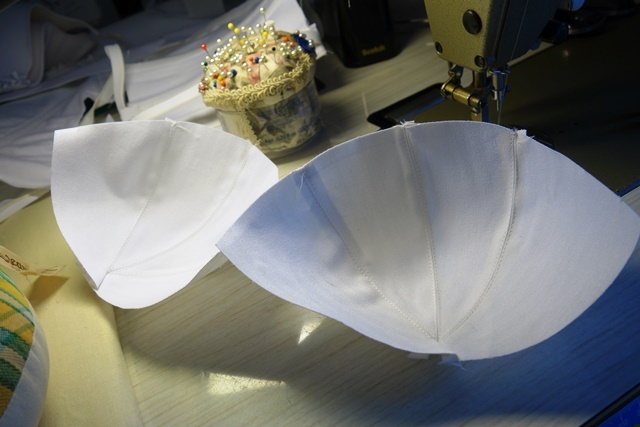 So I decided to make the bra cups myself from the coutil. Luckily, during these frantic sewing marathons, my DD was at work. 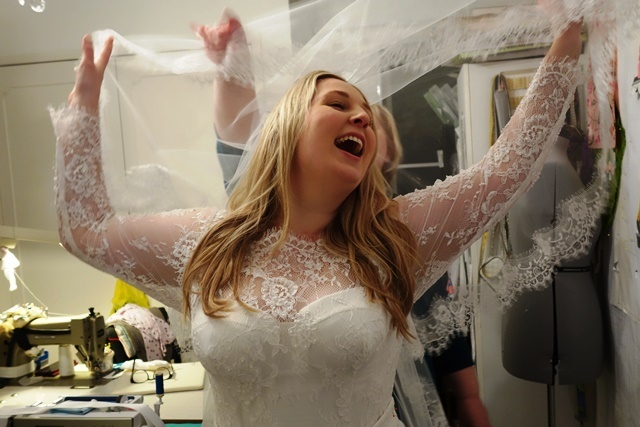 Being a teacher, she was far too committed to her job to take time off before the wedding for dress fittings. She had taken my word for it when I assured her that a few evening fittings were all it would take. And they would have been, if it wasn't for the bodice challenge taking place. I sewed furiously during the day to have something for her to try on in the evenings when she stopped by. I didn't want to panic her. The truth was, I was panicked enough for the both of us! How this bodice continued to elude me was...a mystery. Not only was I confused and distressed, I was plain old fashioned mad about it too! 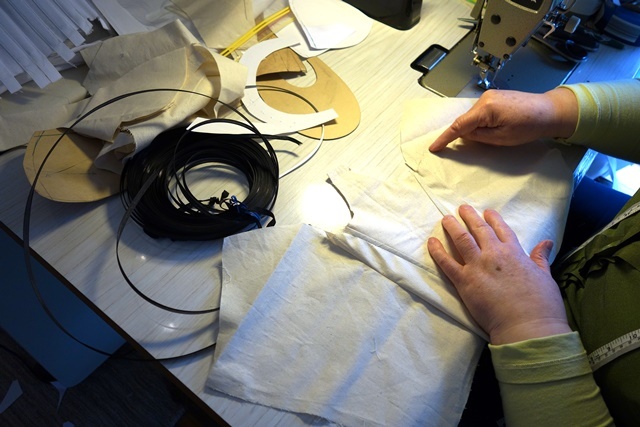 During more extensive Google searching late at night, I found a costuming forum where seamstresses back in 2008 had been discussing the trauma of altering period costume bodices for actresses. One user had commented that she had been told by an elderly European alterations pro to 'draft a bra into diamonds' to reconstruct it. She couldn't understand what this could have possibly meant, but for me, it was a lightening bolt of clarity. Suddenly I knew exactly how to get this built in bra bodice with corsetry elements made! And in the next post I'll show you how I did it. Last week I went to a quilt exhibit, mostly so that I could set my eyes on my favourite quilt in real life. It's so iconic that I'm sure it needs no introduction to you. The lighting inside was very dim to protect the quilts, but photography was allowed so I increased the light exposure on my camera and asked my DD to photograph me in front of this beauty. I look windswept because it was one of those crazy weather days. The thing that surprised me the most, seeing it in real life, was that the centre was much smaller than my brain had interpreted through pictures in books. Because of the increased light exposure, it looks too light here, but it's was quite soft in real life too. What happened when I saw this quilt, was that I remembered I had made those same style Greek borders 10 years ago. And for the rest of the day, I couldn't get it out of my head. Where was that quilt? Did I still have it? Of course, I don't need another project, but I have to accept at my age that I am simply the kind of person who dabbles in hundreds of projects at any given time. It's just who I am. Annoying as it is, there's no point fighting it. So you know what I've done, don't you? I spent a day in the garage digging out old boxes and I found that old quilt and today I am unpicking the beautiful exquisite border from my forgotten quilt because I am in love with the border all over again. And of course I will use it in a new project - as yet undetermined. Thank you so much to everyone who wished me a happy birthday here and on facebook. I'm so touched that you took a moment to wish me well. I had a beautiful and quiet day at home with my family. It's been a hard year for me, with my mother dying in April and my DD getting married (of course that was a happy occasion) but the whole year has been swept into the sadness of my mother's passing and I wasn't feeling as cheerful as I should have on such a significant birthday. Oh well, that's life as they say. Today, I am getting on with some suddenly important unpicking..